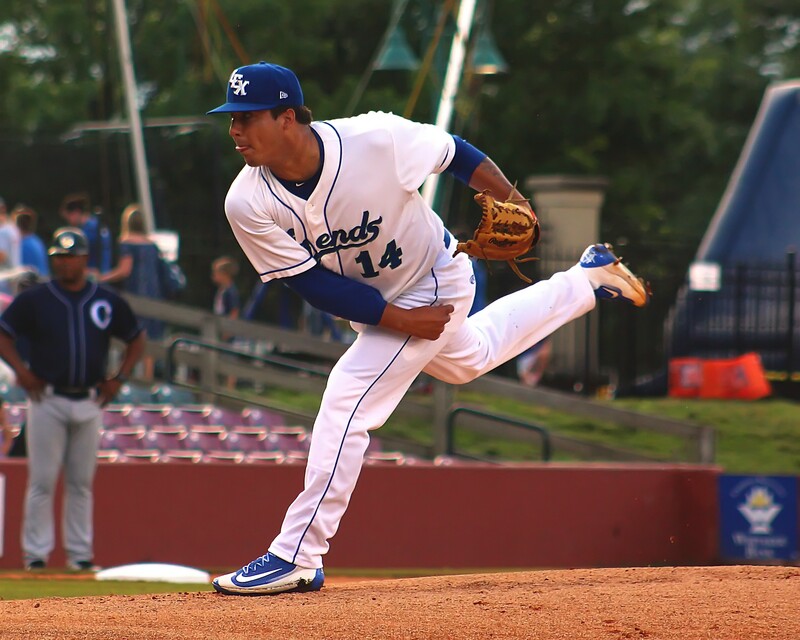 Signed as a free agent in 2015 out of Venezuela, Andres Sotillet has been somewhat under the radar when compared to the virtual logjam of talent now residing in Lexington. However, fans are starting to become very aware of him, as he has steadily built a reputation for pinpoint control and versatility. Sotillet began his pro career in 2016 with the DSL Royals, finishing second in innings pitched (65), first in fewest walks allowed among starters (a minuscule eight), and second in strikeouts (41). Over 13 starts, he recorded a 7-2 record with a 1.52 ERA as a 19-year old. The next season was disastrous, as he finished the year with a 6.67 ERA over 13 appearances (12 starts), split among all three stateside rookie-level Royals affiliates. Of note was his walk rate and K/BB ratio (2.1/9 IP and 3.23, respectively), a continuing sign of things to come. Sotillet turned 21 in March, just a few weeks before he made his Class-A debut. April went very well for him, as he struck out 21 in 19 innings while walking only four, posting a 3.32 ERA. May was even better, as he recorded a 2.70 ERA over 30 innings (5 appearances, 4 starts), and walked only two batters while sending 27 down on strikes. Of some concern was his OPS against (.779), which was 137 points higher than April. Still, he showed an ability to limit damage with runners on (.257 BAA overall, .619 OPS). June was an aberration, in terms of his previous results this year; a disastrous start at home vs. the Charleston RiverDogs severely inflated his numbers for the month (4 2/3 IP, 9 R, 8 ER, 11 H, 1 BB, 2 K). Take away that outlier, and his ERA for the month is 3.98, much closer to his norm. While the Asheville Tourists touched him up for five runs on seven hits in four innings on July 2nd, Sotillet made a statement in his next start when he went the full nine vs. Greensboro at Lexington (7 H, 0 R, 0 BB, 10 K). Despite the base hits, he was never once rattled; when Manager Scott Thorman approached the mound to speak with him in the 9th inning as the bullpen was ready to take over, Sotillet spoke with him for about five seconds before he repeatedly shook his head “no”, as his infielders simply smiled. The game was over, only moments later. Sotillet threw 113 pitches, that night, 79 for strikes (23 looking, 15 swinging), and gave up only one XBH as he faced 32 batters. It was only his second career complete game in 38 starts, the first since 2016. As a starter, Sotillet generally sits around 92-93 with his fastball, spotting and commanding it well, and he compliments it with a mid-high 70s curve with 11-5 break and a change-up at 82-84. Sotillet generally commands all three pitches well, and when he’s on top of his game he carves up the strike zone, attacking hitters and keeping his defense in the game. As a reliever, Sotillet’s fastball ramps up to 95-96 and the curve touches 82 with sharp break. He does get up in the zone with the curve, sometimes, but it seems to happen more often when he’s front-dooring it to a right-hander (as far as what I’ve seen, myself). I’d like to see the change refined a bit, with perhaps a bit more tail and/or sink; such a change would make Sotillet a lock to remain in the rotation as he climbs the ladder. Sotillet’s mechanics are simple and he repeats his motion easily. He drives to the plate and squares up to it in his follow-through, but he also spins off toward first pretty often. This doesn’t seem to cost him in terms of control, however. He maintains a three-quarter arm slot that sometimes gets slightly low, but he seems to remain on top of the ball consistently. Sotillet has great ratios, so far (8.46 K/9, 1.31 BB/9, 6.46 K/BB ratio), and though his BAA is at .294, this is largely due to a .369 BABIP, and I would assume it is unlikely to remain so high. I asked Sotillet about what he’s been focusing on, and what he’d like to improve. “Well, I’ve been working on lowering my chest more in order to finish with better angles/command on my throws,” he said. He’s a ground-ball pitcher, for sure (52.4 percent, 1.96 GB/FB ratio), and has given up only 6 homers in his 16 appearances. One could make an argument that he’s around the heart of the zone too often (107 H in 89 1/3 IP, 69.8 percent strike pct. ), but he makes it work. Sotillet has the profile of a back-end starter, and if he’s moved to the pen, he’s a multi-inning option with mid-90s velo and three solid pitches. His star is on the rise, but his future role (starter or reliever) will likely determine his advancement up the ladder as much as anything else. As I finish this article, Sotillet is finishing his first day at High-A Wilmington (how dare he leave before I finish writing this! ), due in part to the arrival of LHP Daniel Lynch and RHP Jackson Kowar. However, he said that he thoroughly enjoyed playing in Lexington. “I thought (Lexington) was very nice. I liked it a lot,” he related to me. The list of prospects in Lexington just keeps on growing.